Can Trevor lead us to our first B1G victory? Game Summary: If you recall, I made the same score prediction last week. Boy was I wrong. I really hope this game isn’t 34-28, but I don’t have a lot of confidence that the ‘Cats are where they need to be mentally after the last two weeks. The ‘Cats are better than Minnesota. Period. Having said that, we have glaring weaknesses: run defense, pass rush and major inconsistencies on offense. It will be interesting to see how Minnesota chooses to exploit these weaknesses… that is, if they do at all. I see the ‘Cats having a lot more success offensively in this game (how could it get any worse than last week). But I’m still concerned that we’re going to go through periods of the game where we can’t get out of our own way. Expect a nail biter, per usual. 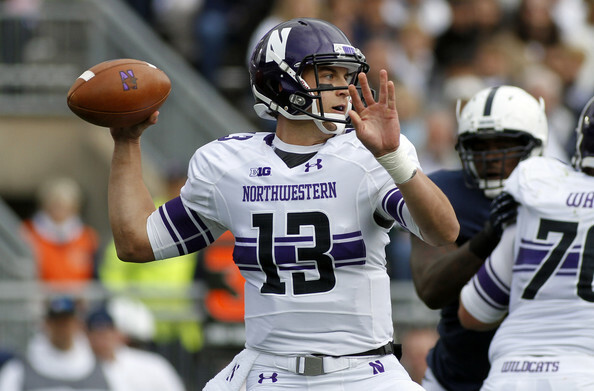 Player to Watch: Trevor Siemian. Can he rebound from what was the worst game of his career? Minnesota is the perfect team for him to have a big day against, but this will be a test of his grit. Game Highlight: The last play. Minnesota will attempt a hail mary as time expires. For a moment, it’s going to look as though someone blew their coverage on a hail mary (a la Michigan 2012), but Ibraheim Campbell will fly across the field to rescue the ‘Cats. On to Iowa…. our slim hopes of a division championship are still alive. As an aside, for those college football fans out there, be sure to tune in to Clemson – Florida State this weekend. Yours truly thinks if FSU pulls off a victory in this one that they’re primed to win their first national championship since 1999. FSU is flying under the radar, but they’re damn good. Thanks Corrine. The ‘Cats wont take any jive either this week, as they start to find some more rhythm on offense. The ‘Cats ability to extend drives keeps the defense fresh and they are able to finally put together a strong 60 minute performance. Kain Colter scores through the air and on the ground and the ‘Cats roll to a fairly convincing win for the first time since Syracuse. Player to Watch: Treyvon Green – He has only had 8 carries since the return of Venric Mark, but I think he will handle most of the workload this weekend, and will find the endzone at least once. The defense responds lead by Ibrahiem Cambell , who forces a fumble which is returned to the house by Mr. Opportunity, Colin Ellis. On the very next play Chance Carter tips a pass to himself ,which he takes to the barn. This turn of events arouses Trevor Siemian from his two week sleep walking spell and he goes on to have a day with Td passes to Mark, Jones, Jones and Prater. Player to Watch: Chance Carter as one of two players who showed up to Wisconsin last week, I look for the good times to continue to roll. Tailgater to Watch: Ryan Sample: In his first true tailgating experience of the year, this crafty vet is sure to take things to that next level. Game Summary: The ‘Cats looked like crap last week, and are lucky to get a down Minnesota team that is without their head coach. Don’t let that fool you – I don’t think this will be an easy victory by any means. I’m expecting a flat Northwestern crowd for the first 11 am game of the season, with our team coming off a blowout loss at Wisconsin last week. It’s sounding doubtful that either Kain Colter or Ricky Football will be available for this game, so this is going to be squarely on the shoulders of Trevor Siemian and Treyvon Green. I think they can get the job done, but just barely. Minnesota is going to run all over us, just like Wisconsin did last week. The key to this game is consistency from Trevor – he needs to be able to move the chains with short, quick passes. Conversions on third down will be huge. Three and outs killed us at Wisconsin last week, when we went 2-17 on third down. I think the ‘Cats will be up double digits in the fourth quarter, but Minnesota will storm back and make us sweat before falling just short. Player to Watch: Tony Jones – he had a couple bad drops last week, but is our only WR who can consistently get open. We need him in this game. Game Highlight: The Warriors crack their first brew at 6:57 a.m. CT.
Game Summary: It can’t get much worse than last week, right? They say the definition of insanity is doing the same thing over and over yet expecting different results. Well Mick McCall is insane, judging by the constant use of 5 step drop backs against a Wisconsin D Line that no trouble generating pressure. It’s tough to get excited about the ‘Cats right now. But guys, it’s fall. It’s just chilly enough for sweater weather and dammit if I don’t love this time of the year. Also I made salsa this week for the tailgate. New recipe. Come try it out on our breakfast burritos. The B1GCats will win. But it’ll be too damn close for any of our liking. Kain and Ricky won’t play. Trevor will start and bounce back from his awful performance against Wisconsin. Tony Jones is going to have a big game, and the ‘Cats won’t have any trouble scoring through the air. Without McElvy (someone spell check that), the rush defense will give up some points and big yards. Minny won’t have too much trouble scoring either. That’s all folks. Go ‘Cats!